Soft deleted data is grey, while active data is blue. More recently written data appears beneath older data. When B0 is overwritten with B1, a soft deleted snapshot of B0 is generated. When the blob is deleted, the root (B1) also moves into a soft deleted state. Soft delete is 100 percent backwards compatible; you don’t have to make changes to your applications to take advantage of the protections this feature affords. With this GA announcement, we have added support for tiering blobs with soft deleted snapshots. When Set Blob Tier is called on a blob with soft deleted snapshots, the snapshots will remain in the original storage tier and expire based on the retention period you configured. Soft delete is supported by Azure Portal, .NET Client Library (version 9.0.0), Java Client Library (version 7.0.0), Python Client Library (version 1.1.0), Node.js Client Library (version 2.8.0), PowerShell (version 5.3.0) and CLI 2.0 (version 2.0.27). You can also directly use the Storage Services REST API as always. Soft delete is supported by REST API version 2017-07-29 and greater. In general, we always recommend using the latest version regardless of whether you are using this feature. 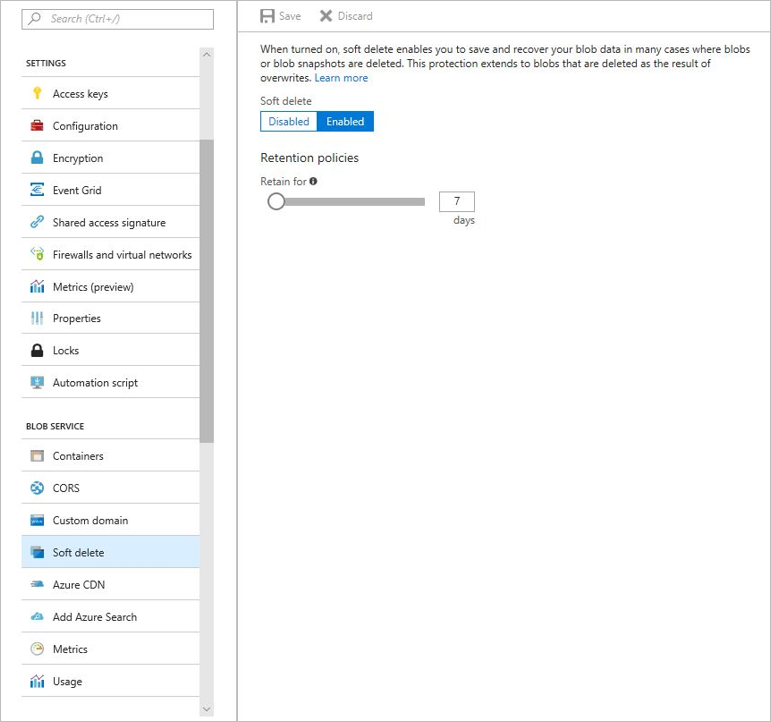 To enable soft delete using the Azure Portal, navigate to the "Soft delete" option under "Blob Service." Then, click "Enabled" and enter the number of days you want to retain soft deleted data. Soft delete helps ensure that you can recover accidentally deleted or modified blob data. Soft delete is a key part of an overall data protection strategy that includes Azure Resource Manager locks as well as the ZRS, GRS, and RA-GRS replication tiers. We look forward to hearing feedback about this feature on this post or at Azure Feedback.